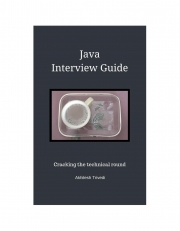 Description of "Java Interview Guide (eBook)"
Java interview guide is to prepare you for the initial technical rounds of any Java Interview. If you are java-geek and preparing for a tehnical interview or if you would like to brush up your knowledge on important core java concepts, then this book is for you. Akhilesh Trivedi is Tech-Lead in a multinational IT firm. He has 11 years of experience in Java/J2EE technology and has previously worked with IIT Madras, D&B Transunion and Bank of New York. Reviews of "Java Interview Guide (eBook)"